The Greenbrier Resort in West Virginia is an icon in America’s hotels. So much history, so many celebrities, so much to see and do….if these walls could talk! In my last post, I talked about much of that, so in this one I want to focus on the newest part of the hotel, the casino. I am not a big gambler, but if I were, the Greenbrier casino would be my favorite, by far. First of all, there is no smoking! Best rule ever! Second of all, there is a dress code. Thirdly, only resort guests allowed (with one exception: see the Greenbrier policy page.) That is my kind of place to hang out and people watch. I did find one game that caught my eye. 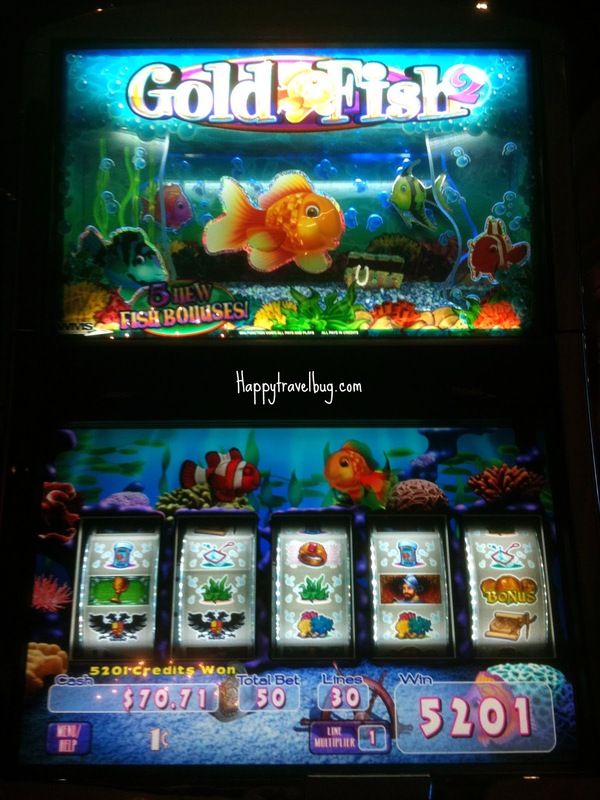 It was a penny slot machine called Gold Fish. I put $20 in and had the most fun time. I ended up hitting the “penny” jackpot and made $50! It was so much fun! After I hit my jackpot, I called it quits and took my winnings to the Twelve Oaks equestrian-themed lounge. There was a jazz singer belting it out while I sipped my mint julep and enjoyed my husband’s company. By far, the most enjoyable evening in a casino I have ever experienced. When we visit the Greenbrier, we stay on site the entire time. Therefore we have eaten at most of the restaurants there. Prime 44 West is a fantastic steak place and the Main Dining Room has fantastic food and service all set in the classic Greenbrier decor! I love eating at both of these places. Drapers is great for lunch. They have this fried green tomato sandwich served with sweet potato fries…yum! And the Gourmet Shoppe is a great place to grab a quick breakfast on the go, if you are heading off to the clinic, the spa or the golf course. On our last trip, we tried the newest restaurant, In-Fusion. It is located inside the casino and for adults only. Which is nice if you are wanting a little quiet time from the kids. As you can see above it is an asian inspired restaurant. The sushi and tempura we very well done. For entrees, my husband had the Soy Lacquered Chilean Sea Bass with Kombu Ginger Broth, steamed Leeks and Shiitake; and I had the Lobster Pad Thai with Rice Noodles, Toasted Peanuts, Sprouts, Cabbage, Chillies and Fresh Lime. His was amazing, my was just okay. Not sure why I didn’t love it, but I didn’t. It seemed too peanutty for my taste. But I was not disappointed for long, because we ordered desert and it was unlike anything I have ever tasted, in the most excellent of ways! 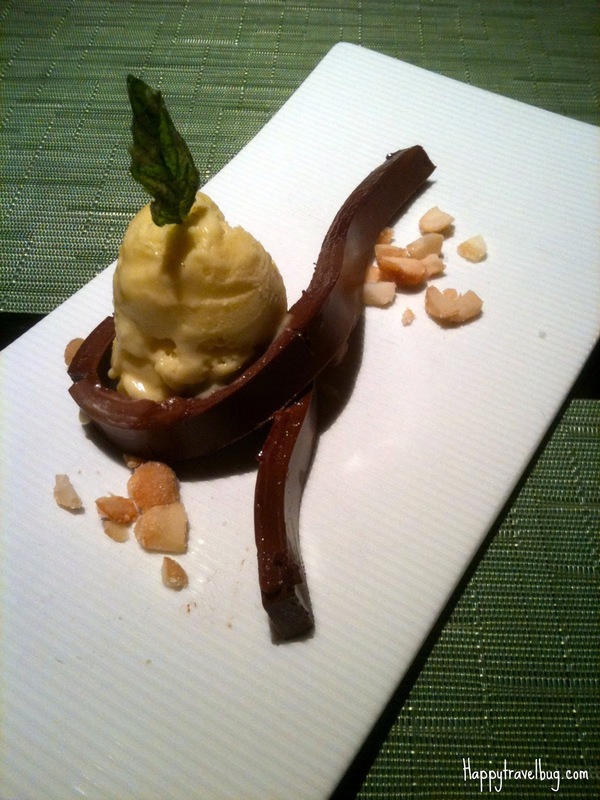 It was chocolate “bamboo” with nuts and basil ice cream! Yes, basil ice cream! One of the best things I have ever tasted in my life. I could have eaten a gallon of it! I hope they never take this off the menu. Every night in the casino there is a champagne toast and the “Greenbrier waltz” under the gazebo. It was so lovely. Imagine sipping your champagne and dreaming of traveling back in time. That is what the Greenbrier does for you. One of my favorite places ever! Basil ice cream…I've never heard of that. I'm a history buff like you and this place looks like something I would love. I had never heard of it until I saw it on your blog. I will have to look into it for our next weekend getaway. That basil ice cream was amazing! I've never seen it anywhere else. Please do visit the Greenbrier, if you are a history buff, I know you would love it.